America is finger lickin’ good! Photo courtesy of Daniel Allen. I want you! … to eat more chicken! And look, he’s with the Dalai Lama! Casue KFC is the home of America, right? 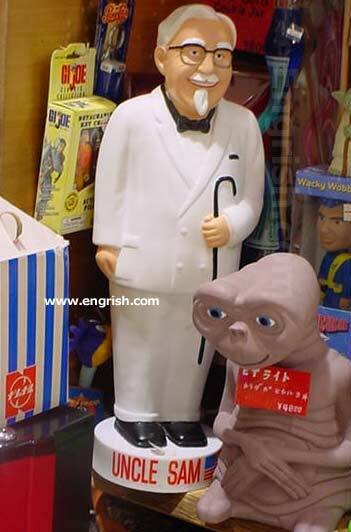 Weird, E.T. is right next to him! Only the CIA knows the 11 secret herbs and spices. I know America is run by corporations, but do they have to be so blatant about it? I want you to buy me! And never mind if I don’t look like Uncle Sam, just buy me, dammit!